Apple tried to change the headphone landscape in 2016 when it announced that it planned on removing the 3.5mm headphone jack from the iPhone 7. To replace the 100-year-old standard, it announced three new Beats headphones and the Apple AirPods that all use a new proprietary wireless chip called the W1 that improves battery life and sound quality over Bluetooth. Since then, two of those headphones – the Powerbeats3 and Beats Solo 3 Wireless – have already hit the market. 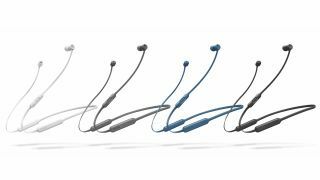 The third one, the BeatsX, went MIA until this morning when the company broke its silence and tweeted that we’d finally get the in-ear earbuds Friday, February 10 for $150, £130, AU$200. While AirPods offer the first ‘truly wireless’ experience – e.g. no wires between the two drivers – the BeatsX reportedly offers higher-quality sound. The headphones charge via Lightning Cable and are reported to be able to last two hours on a single five-minute charge. As seen in the accompanying video, the two 9mm drivers snap together thanks to the help of some magnetics, hopefully preventing the tangle of wires many of us know too well. Apple says the headphones have an 8-hour battery life, and comes with an in-line remote that has a built-in microphone, allowing you to take calls at the gym and annoy everyone around you. The other interesting piece of news is that Apple tells CNET that the BeatsX will ship in two additional colors – Grey and Blue – on top of White and Black, the two colors the company had previously announced. Are they any good? We’re just going to have to wait until Friday to find out.